Cheese is a major food trend, and there are more types on display at the supermarket than ever. Cheese takes some of the mystery out of all those tantalizing new cheeses, and encourages you to try some of the more unfamiliar flavors. Delicious and irresistible-Cheese celebrates one of the most heavenly natural foods you can buy. 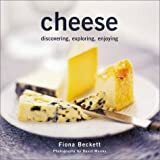 Award-winning author Fiona Beckett reveals why cheeses taste so different, what to look for when buying cheese, and how best to store them at home. She provides specific advice on blending complementary flavors and textures on a cheese board. While cheese is wonderful enjoyed on its own, Fiona gives us some exciting and unusual bread and cracker recipes to enjoy with cheese, a foolproof recipe for fondue, and her family's all-time favorite cheesecake. Whether your passion is for a strong salty Roquefort, or a soft creamy Camembert, Cheese is guaranteed to double your enjoyment.